CellMapper freeware for smartphone, Windows mobile phone free downloads. 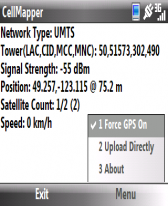 CellMapper is a Windows Mobile 6.x application (standard edition compatible) which is used to help map the extent of cell phone towers coverage. The program records the location, using built-in GPS, and the cell phone tower signal and information at that location. It is able to both upload the information directly to the database or generate a CSV file in order to be uploaded later (for those that do not have a data plan). Once the data is submitted, it will be instantly mapped and displayed on the cellmapper.net website. CellMapper works on any network and network type.